Even if you never read my Molton Brown reviews before, you probably noticed that the brand shows up pretty often in my empties and favorites posts. I am the biggest fan of their body washes, so I go through them quite quickly. Recently the company released a brand new collection and of course I was dying to give it a try. Molton Brown is known for their incredible fragrances and limited edition collections that capture the essence of the season. Jasmine & Sun Rose came out at the end of August, right where summer meets the fall, so we got a warm and welcoming bouquet that contains lovely florals and bold, rich base notes. This new chypre fragrance encompasses the complexity of what it’s like to be a modern day woman, and makes me feel like a total boss babe when I wear it. It’s fruity, floral, and lightweight, but at the same time packs a powerful punch and makes a bold statement. The products are easy to layer, and work well together to enhance certain notes of the bouquet that you like the most. For me, body wash + body lotion combo is the best because it showcases the sweet fruits and florals of raspberries, peaches, and jasmine; and slightly tones down the musky base. Eau de Toilette is a great choice for those who love rose [which I do, but I prefer Molton Brown Rosa Absolute collection for that], and if you layer it with the body lotion, it will make the patchouli shine as well to give the scent a boho kick. For me, the body washes are where it’s at. I could easily live without the EDT, the lotion, and the oil, but I have a huge weakness for Molton Brown bath products. They are among my top beauty splurges, and even though I receive new releases complimentary from the brand, I still buy the body washes on my own at least once every other month. 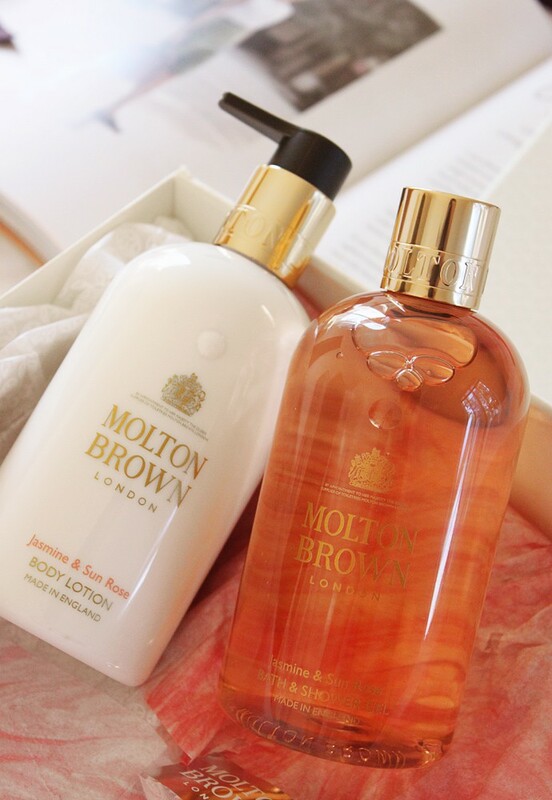 There’s just nothing like a Molton Brown shower, once you try it you’ll be hooked! At this time Molton Brown Jasmine & Sun Rose collection includes four products: a Bath & Shower Gel, Body Lotion, Bathing Oil and an Eau de Toilette in 1.7fl oz and 3.3fl oz sizes.